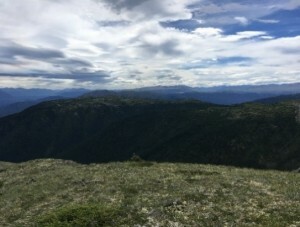 Vancouver, British Columbia, Canada – HAWKEYE Gold & Diamond Inc. (the “Company” or “HAWKEYE”) (TSX.V-HAWK; Frankfurt Ticker: HGT; WKN: A12A61 ISIN: CA42016R3027): is pleased to announce that the Company has acquired an additional 137 hectares in the northwestern section of the McBride property and that it will commence a Phase 2 work program over the property scheduled to begin on October 7, 2018. 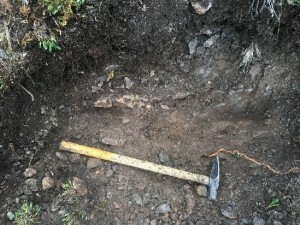 The work program is designed to evaluate the historically reported high-grade copper mineralization from the “Breccia zone” situated on the newly staked claims, revisit the new copper discovery exposed by hand trenching and follow up areas of anomalous copper and gold-in-soil results identified during HAWKEYE’s Phase 1 program, and to perform additional stream sediment and soil geochemical sampling. Left: McBride property looking south toward the Red Chris mine. Center: Hand Trench (approximately 2m x 3m) showing a chalcopyrite and malachite-bearing quartz-iron carbonate vein breccia. 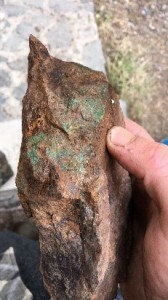 Right: Malachite-stained grab sample hosting disseminated chalcopyrite. All soil and rock samples will be delivered directly by the crew to ALS Global’s analytical facility in Terrace, B.C. for preparation, and subsequent precious metal and multi-element analysis in their North Vancouver laboratory. ALS Global in North Vancouver, British Columbia, Canada, is a facility certified as ISO 9001:2008 and accredited to ISO / IEC 17025:2005 from the Standards Council of Canada.